Apple’s iOS 8.1.3 update is a large incremental update to the iOS operating system and it delivers a series of bug fixes and improvements for devices compatible with iOS 8. It’s not as big as the iOS 8.1 update that rolled out last year but it’s still a significant upgrade and one that many iPhone and iPad users are thinking about installing. In the past 24 hours, we’ve received a number of questions about iOS 8.1.3 and it’s stability. Smaller iOS updates often have a big impact, both positive and negative, on performance. So it’s no surprise that tons of people want to know if the update is worth installing, right now, ahead of iOS 8.2. Everyone’s situation is going to be a little different so we want to touch on five reasons why we think you should upgrade your iPhone/iPad to iOS 8.1.3. Remember, Apple never forces you to install its iOS software so if these reasons don’t fit your needs, you can always revisit the iOS 8.1.3 update at a later date. While we’ve seen a few iPhone and iPad users complain about iOS 8.1.3 battery life problems, a majority of the user feedback we’ve seen indicates that iOS 8.1.3 has actually had a positive effect on iPhone and iPad battery life. Here’s a small sample of what we’ve discovered so far. This kind of feedback is actually a bit unusual after an iOS update. 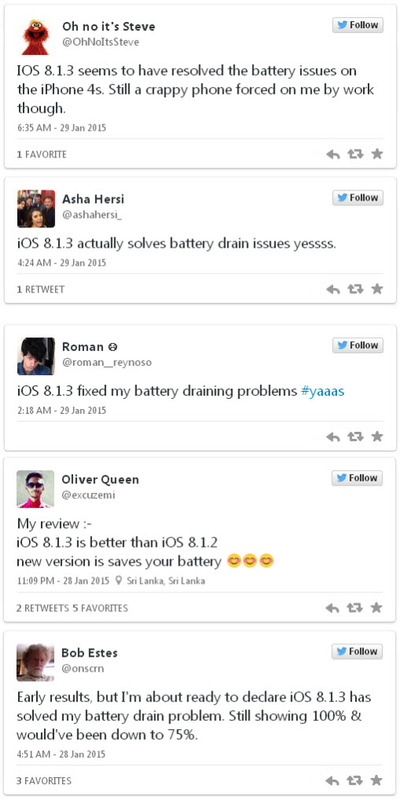 A fix for battery drain problems wasn’t listed in the iOS 8.1.3 change log but it appears that iOS 8.1.3 has helped to settle battery life issues on at least some iPhones and iPads. This doesn’t mean that it’s guaranteed to solve your battery drain problems but an upgrade to iOS 8.1.3 is probably worth a shot if you can’t find any other fixes. We’ve been putting iOS 8.1.3 through the gauntlet over the past day or so and what we’ve found is a stable piece of software across most devices like iPhone 6, iPhone 6 Plus,iPhone 5s, iPhone 5, iPad Air, iPad mini 2, iPad 3, iPod touch,etc. many other iPad 2 and iPhone 4s users also found that the iOS 8.1.3 is a very stable update. Major iOS issues typically jump right off the page, immediately after the release. Smaller issues are a little trickier to find but we’ve been scouring forums and social media in an effort to identify major iOS 8.1.3 problems and we’ve come up empty. Most of the problems we’ve seen are isolated issues. There’s one calendar bug that appears to be causing problems but if you’re already on iOS 8, there’s really nothing you can do. The iOS 8.1.3 update also comes with a fix that “reduces the amount of storage required to perform a software update.” This is a huge development, especially for owners of 16GB iPhones and iPads. In the past, updates have required tons of free storage to install OTA. The issue can be bypassed using iTunes but that didn’t make it any less annoying. With iOS 8.1.3 on board, you’re now going to be able to install iOS updates OTA without having to delete a ton files or use iTunes. This is going to make installing iOS 8.2 and upcoming updates like iOS 9 a whole lot easier. If you’ve run into this problem in the past and you’ve prepared for iOS 8.1.3, go ahead and install it today. If you can’t fix an iOS 8 problem that isn’t listed on the iOS 8.1.3 change log, you might want to think about installing the iOS 8.1.3 update right now. Often times, iOS updates will fix issues that aren’t listed on the change log. We listed one of those issue, the battery life problems, above. It has a chance to fix other issues as well. If you can’t find a temporary fix or a permanent fix, it’s worth rolling the dice. iOS 8.1.3 appears to be an extremely stable update and so the odds of it negatively affecting your already negative experience are slim. If you’re already on iOS 8 and you’re struggling, make the move to iOS 8.1.3. If you’ve prepare for the iOS 8.1.3 update, you want the latest bug fixes and enhancements, and you don’t care about jailbreaking your iPhone or iPad, you can go ahead and install the iOS 8.1.3 update right now. The iOS 8.1.3 update breaks the TaiG iOS 8.1.2 jailbreak which has left many iPhone and iPad users peeved. Most people don’t use jailbreak software though. If you’re not at all interested in jailbreaking right now, or in the future, you might want to think about moving up to iOS 8.1.3 right now. iOS 8.1.3 is currently very stable and again, it comes with some very intriguing bug fixes that are attractive to all iPhone and iPad users, not just those dealing with iOS problems. This entry was posted in News and tagged ios 8.1.3, iPad, iPhone by IosdroneD. Bookmark the permalink.